I know some people have blogs but they are not create anyone, only thing they do is copy and paste postings from other blogs. I think most people do care about it, but if they use your blog earn money from Google AdSense, it will be difference. How can you do if you found someone copied your blog? Recently, I read an article what talk about How to report duplicate content to Google. I did not know that before read it. 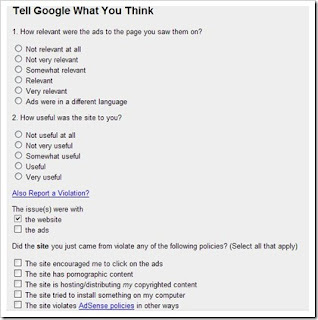 Actually, it is very simple: Click on the "Ads by Google" of Google ads, at the bottom of the page, you can see this link “Send Google your thoughts on the site or the ads you just saw”, you can report something to Google by clicking on the “Also Report a Violation” link. Pick some related violations that you wish to report and click the submit feedback button. But it does not mean Google will take action, I think maybe it will take action after enough violation reports.